College basketball mirrored the presidential campaign most of this season, with established big money programs being shocked repeatedly in a year of parity. But while the political establishment failed to slow Trump in Nevada, three basketball players appear to propel established blue bloods surging into March Madness. MSU’s Valentine: Because each player’s value is 0.0 in games in which they do not play, Denzel Valentine fell a couple of dozen spots while missing four games to injury. He had a couple of mediocre games getting back to 100%. In the past month, he has been the best player in the country. His average line in the last eight games: 4-7 three-pointers, nine assists, seven defensive rebounds. In the 24 games played to date his Value Add is 9.71 per game – best in the country – and even with the four games missed he only slips to ninth at 8.32. Michigan State won seven of those eight games by at least nine points, including two by more than 30 points, with the only loss coming in an 82-81 game against Purdue in overtime. The Spartans could have another player of the year and national title. When he plays, Valentine is the best player in basketball and Michigan State is the best team. Duke’s Allen: Valentine watched Duke’s Grayson Allen come off the bench and dunk to help eliminate the Spartans in the semifinal last year. Allen went on to be the surprise key to the national title win over Wisconsin. Value Add accounts for level of opposition faced, and during the past eight games of ACC play some of the best defenses in the country have been forced to foul Allen repeatedly trying to stop him – and Allen made them pay by making 51 of 60 free throws. In consecutive huge wins over Louisville, UNC and Virginia, Allen rested one minute total. 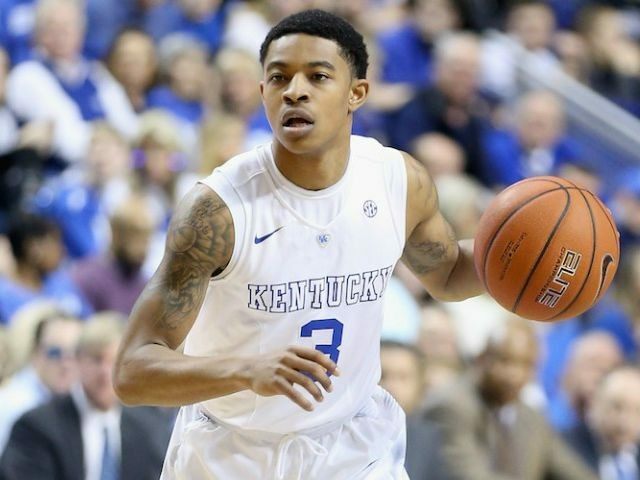 Kentucky’s Ulis: Tyler Ulis and his Kentucky teammates were the only ones to shut down Allen this year in a double digit win on a neutral court. The young and talented squad proved inconsistent after that win – including a shocking loss at Auburn – but Ulis is now the best point guard in the country and organizing the young talent on a run. The 5-foot-9 floor general averages more than 10 assists a game during the past six games, and the only loss during that span was a 79-77 overtime defeat at Texas A&M in which he played all 45 minutes. If those three continue as the best three players in basketball – as they have been for the past month according to Value Add Basketball – then the familiar names of Michigan State, Kentucky and Duke may combine to fill a lot of March Madness bracket lines in the weeks ahead.